There’s nothing better than lingering over a meal with people I love. And now, Nathan and I have a very special place to do so. 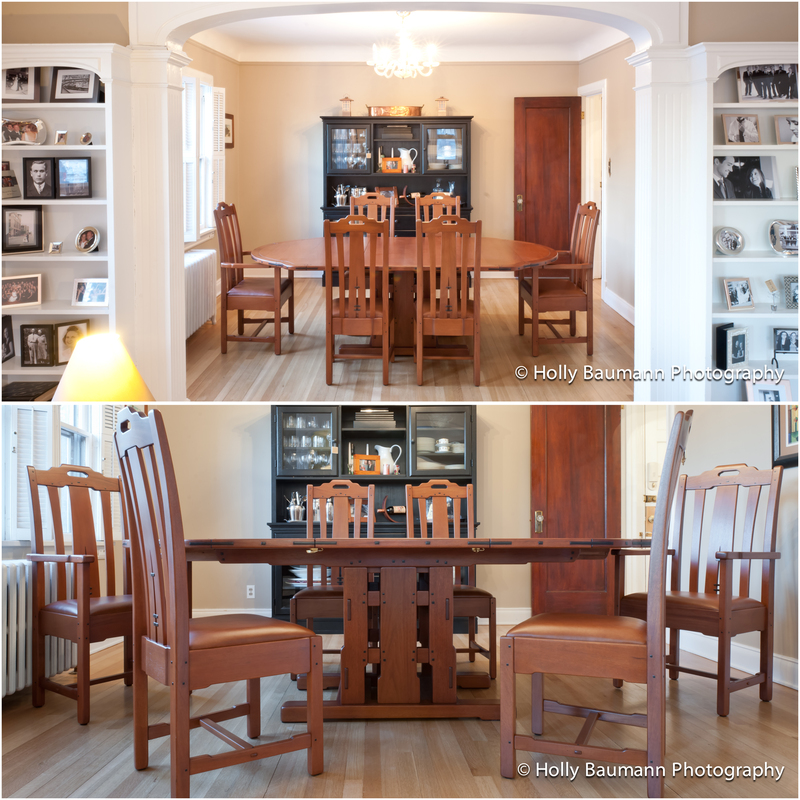 We recently became the very happy owners of a beautiful dining room table that is truly a work of art, built by Nathan’s brother Ross over an almost two-year period. In order to further convey the significance of this project, let me back up a bit and provide some context. I always say my husband is the most well-rounded person I’ve ever known. When we met, I was still working in public policy, flexing my social-justice/social-worker muscles, and doing portrait and event photography on the side. I wasn’t shooting architecture yet. Since we met, I’ve learned about so many things from Nathan, including jam bands, skiing, farming, boating, motorcycles, cigars, construction, coffee roasting, card games, horse track betting, Dean Koontz, mountain biking, architecture, and design. Nathan’s specific interest in the arts and crafts design movement is evident throughout our home, dotting our walls and bookshelves, specifically the works of Frank Lloyd Wright and Greene and Greene. The latter, a team of architect-brothers, designed the entirety of the exterior and interior, including furnishings, of the Gamble House in Pasadenda, CA (once owned by the family behind Proctor & Gamble). He shares this interest with (or perhaps attributes it to) his brother, Ross, who is a furniture craftsman, working full-time in his trade for Prairie Woodworks (PW) in central Illinois. 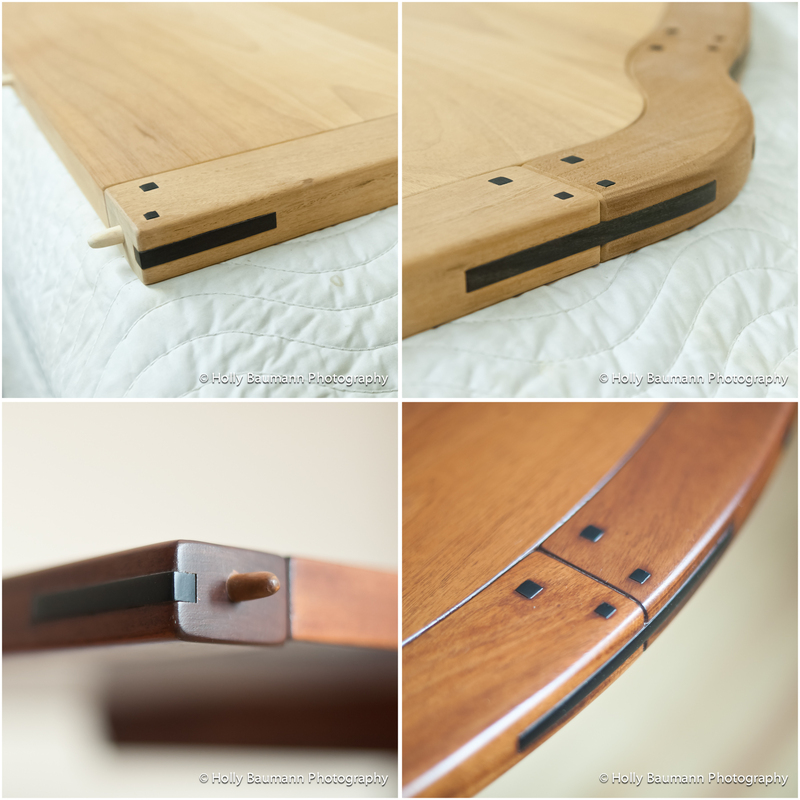 Almost 15 years ago, Prairie Woodworks began constructing a replica of the Gamble House Dining Table, but only built the table’s base before the project fell apart for a number of reasons. Since then, the base has been sitting in a corner literally collecting dust, too valuable either to discard or finish without an additional commission. Knowing this, Nathan told me when we were dating that he intended to buy the base from PW and hire Ross to finish the table for him someday. Fast forward to our first year of marriage, when Nathan and I toured the Gamble House together on a trip to LA. 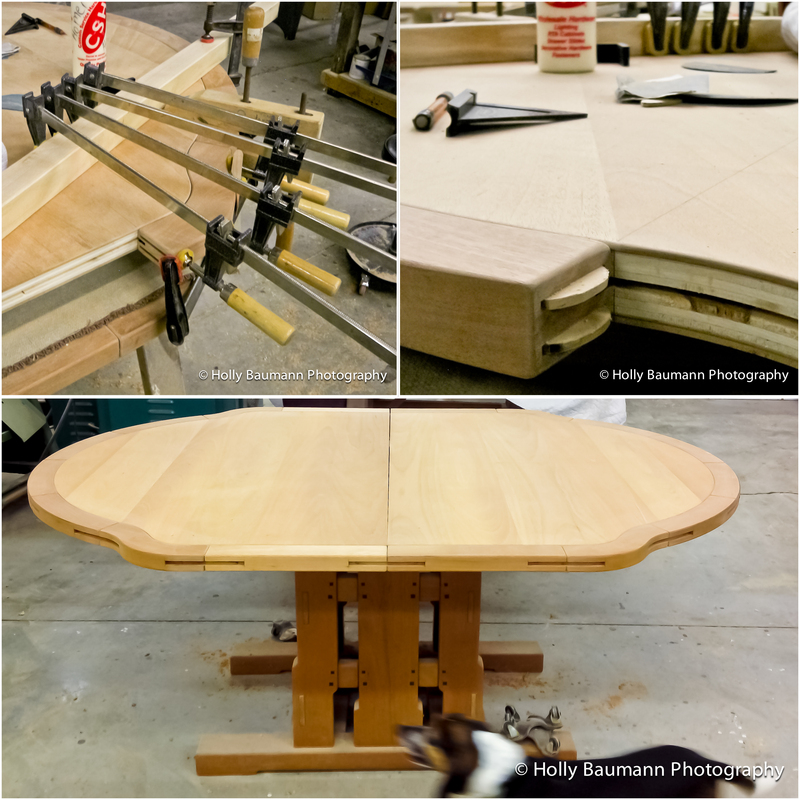 Once I saw the dining table in person, and understood more about the philosophy of its original designers, I began to share Nathan’s excitement about finishing that lonely, half-built table. The values underpinning the arts and craft movement resonated with me. The designers believed that when their commissioning clients witnessed the artisanship, time, and attention required to construct their designs, they’d develop more of an appreciation for the working class. Their deep love and respect for nature is evident in their designs, and in their chosen materials. They took pride in every detail, spending great amounts of time on each project. Fast forward again to 2011, when I visited the table in person for the first time on a trip to see family in IL. At that time, it would have been easy for one to miss, buried under a pile of clutter in a corner. Truly a diamond-in-the-rough. Ross is a craftsman. 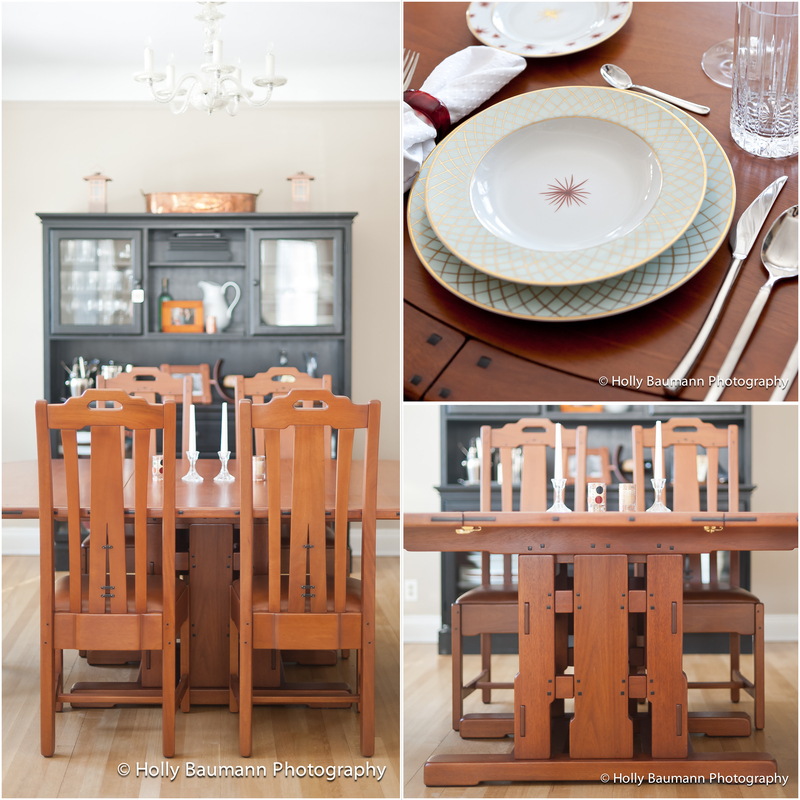 We knew he could rescue “our” table and make it into a beautiful family heirloom. But not the kind of heirloom that goes untouched; rather, one that years from now will show the signs of loving wear, daily use, countless meals and memories with friends and family. Ross unburied it, and began to work his magic. 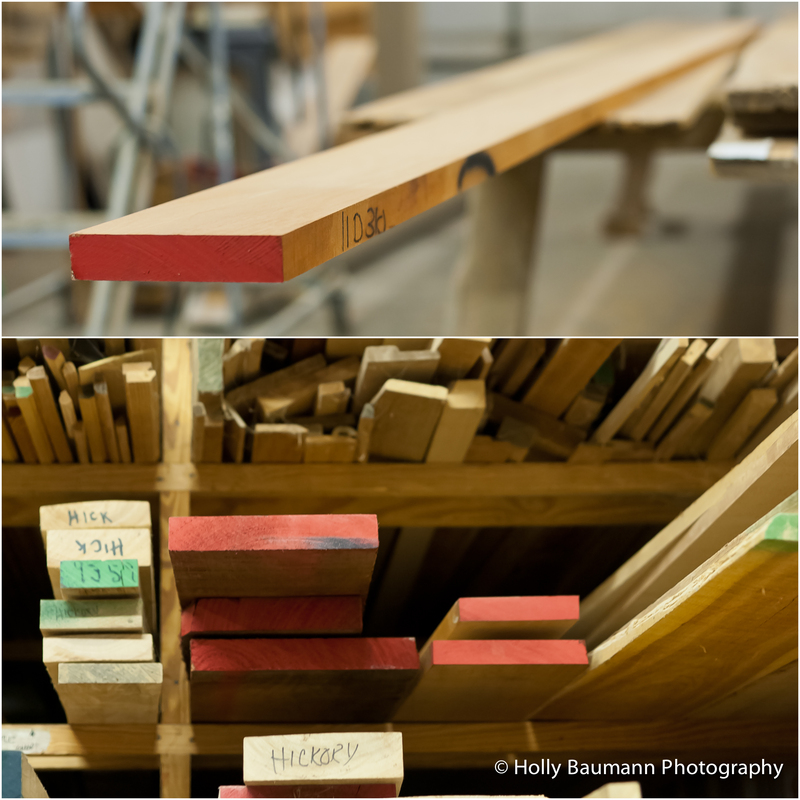 In mid-2011, he ordered the wood to began constructing the table top. But for a while, it sat in a bay along with materials for other clients’ projects. 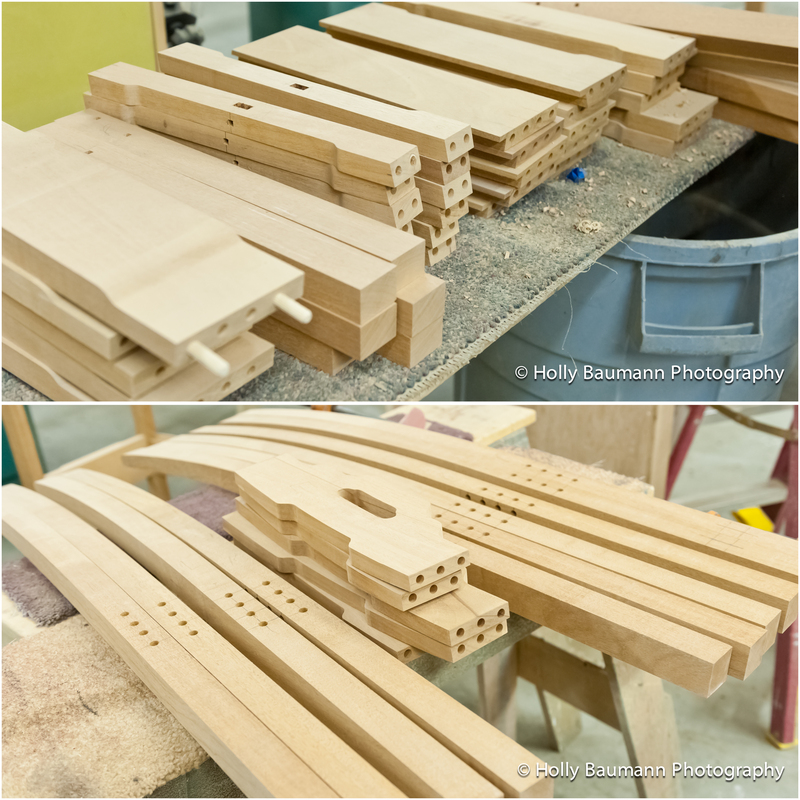 By early summer 2012, the major pieces were cut, and the detail and trim work began. Nathan and Ross worked together on a design for our table that would allow us to comfortably seat at least ten people (my request). This makes our table longer than the original, requiring two removable leaves (the original has one). We saw the unstained table, with all of its major pieces including the leaves completed, on Labor Day weekend, 2012. The table is constructed of mahogany, and the inlay detail is ebony. 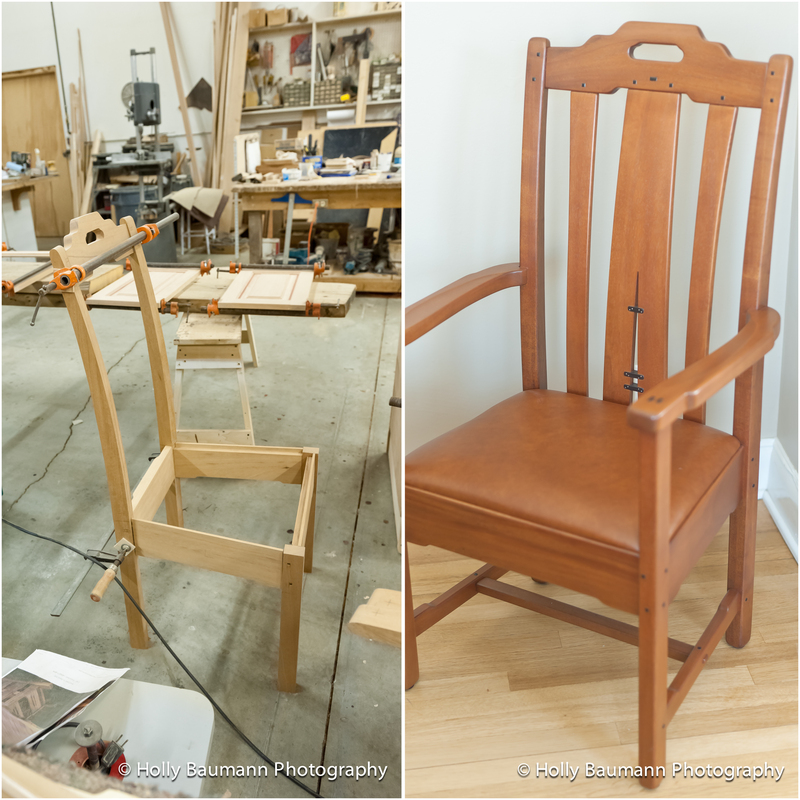 During the fall of 2012, Ross and his co-worker began cutting pieces for the chairs. Ross explained to us that chairs are the most challenging thing for a woodworker to construct, because they are so complex. 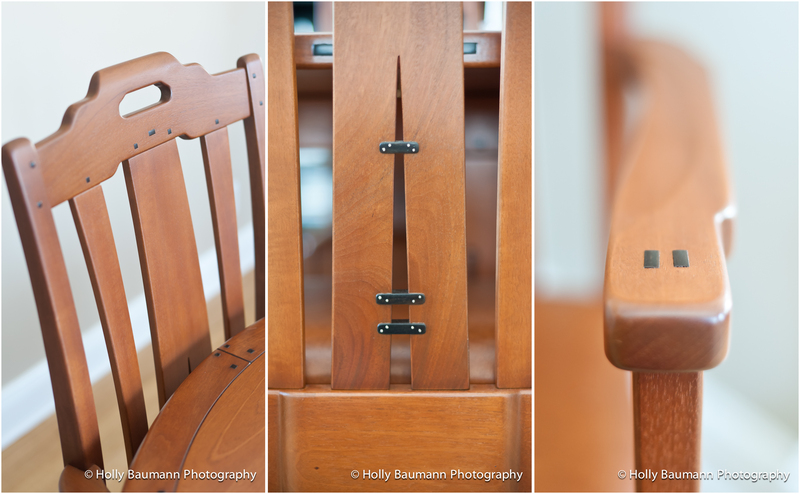 Ross and his partner added some unique design details to our chairs not found in the originals, including some silver inlay and a groove on the arms of the Captain’s chairs. 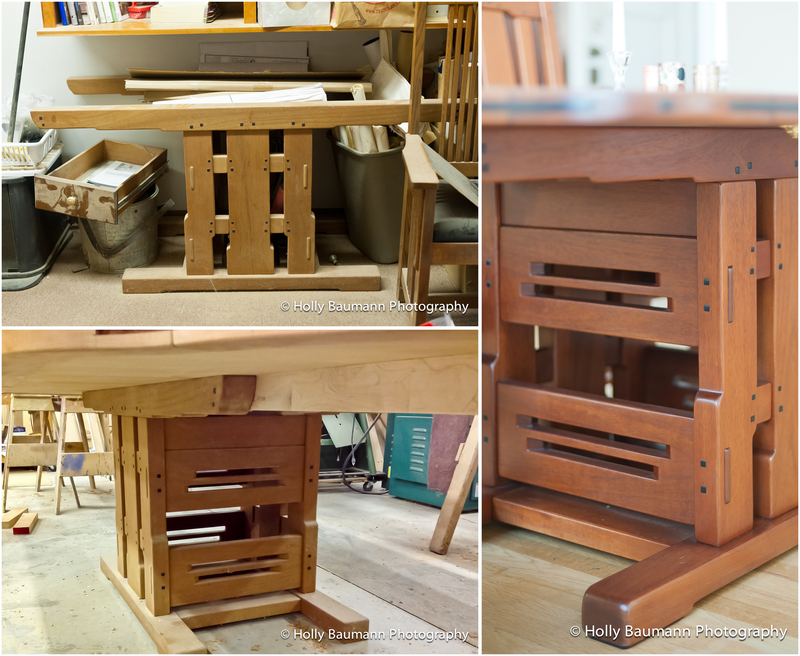 On December 23rd, 2012, Ross packed and loaded the table and chairs into an enormous plywood crate that he built just for this purpose. With that crate hanging off the back of his truck, he drove straight through from IL to Cheyenne to deliver his creation to us in person. 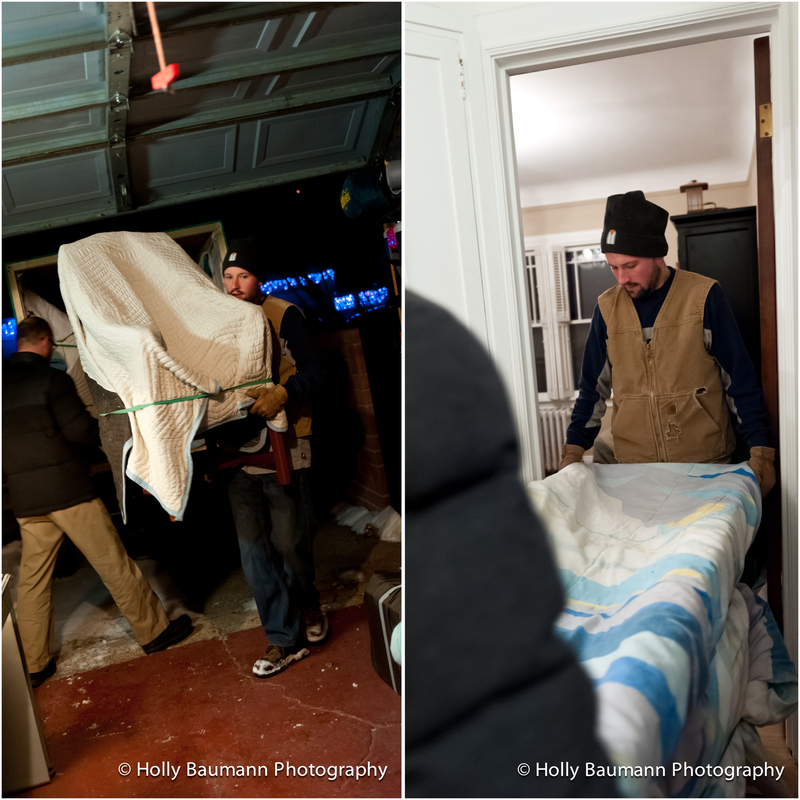 Nathan and Ross unloaded the pieces late that night in the freezing cold. On Christmas Eve, Nathan and Ross assembled our table. The tabletop slides apart in a unique way to allow the leaves to be added. Nathan and I chose a stain that closely mirrors the original (with maybe a bit more red). The chairs were upholstered in a high-grade leather, in a color that closely matches both the table’s stain and the upholstery of the original. We didn’t want the upholstery to compete for attention with the table itself. I looked over Ross’s project notes while he was in Cheyenne. He spent a total of 129 hours finishing the table and 125 hours constructing the chairs, not counting the hours spent driving to and from Cheyenne and assembling it. 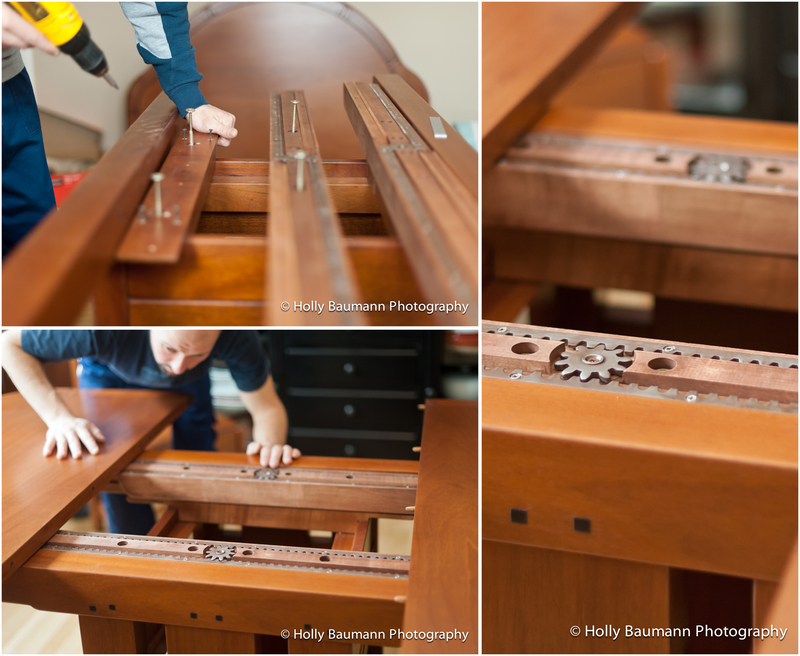 How many families are as lucky as we are, to own a piece built so carefully, over so much time? Our Cheyenne home, built in the 1920’s when so much time and attention was still spent on a home’s details, is the perfect showcase. Ross told us that he and his co-worker agreed that this table and chairs are the best pieces they’ve ever built, which is saying something, since they build furniture and cabinetry on a daily basis. We couldn’t be prouder of Ross! And all of us are glad that such a high-quality piece of his work is staying in his family. This table represents the confluence of so many of our values. Not only does it come from the hands and soul of someone we love, and from a school of design that we appreciate, but it will be a centerpiece, a fixture in our home – forever. I know we’ll spend many nights around it, candles burning down, empty wine bottles piling up, laughing into the wee hours of morning. It’s the stuff memories are made of. This entry was posted in Before and After Images, My Family, Product and tagged arts and crafts, arts and crafts furniture, captains chair, Cheyenne, Cheyenne Architectural Photographer, Cheyenne Commercial Photographer, Cheyenne event photographer, Cheyenne event photography, Cheyenne exterior photographer, Cheyenne exterior photography, Cheyenne interior photographer, Cheyenne interior photography, Cheyenne Photographer, Cheyenne photographers, Cheyenne portrait photographer, Cheyenne portrait photography, Cheyenne product photographer, craftsman, craftsman dining table, craftsman furniture, custom dining table, custom furniture, custom table, ebony, event photographer in Cheyenne, event photography Cheyenne, exterior photography Cheyenne, family heirloom, Gamble House, Gamble House furniture, Gamble House replica, Gamble House table, Greene and Greene, Greene and Greene replica, Greene and Greene Table, inlay, interior photography Cheyenne, mahogany, photographers in Cheyenne, photographers in Wyoming, product photographer, product photographer Cheyenne, product photographer Wyoming, wood, Wyoming product photographer. Bookmark the permalink. Now Blogging on a New Site! Grant Writing Series – Coming Soon!